Me: Mad as Hell is continuing to have an impact on the zeitgiest, with you being referenced from what you’re referencing (ie. Darius Horsham), how is the season feeling for you? Is it feeling as comfortable at the previous one? Shaun: It feels as comfortable. I think the main difference between the season earlier this year and this one we’re doing now is that there’s a lot more at the desk just of me talking, and also we’ll often spend 5, 6, 7 minutes on a given topic, rather than being driven from news item to news item. It’s actually a bit more openly editorial now, it’s just me having a conversation. Apart from news from other countries, I’m not really playing a news reader now, I’m just talking to the audience. We were on our way to that in the first season this year, it just feels that’s mainly what the show is now. And a lot of the language of the show is quite peculiar now, and not terribly related to what a news show is. Do you have plans to continue Mad as Hell in 2015? That’s the plan, to come back in February and do another season. It’s as locked in as anything can be at the ABC. So we’re not ending the series, but at the very least we’ll come back and do 10 next year. I’m really enjoying The President’s Desk, I really liked that among the editor’s note, introduction, and preface, you made a note to the genuine inaccuracies, like the positioning of the Oval Office. Is there anyone you’ve ever thought may have actually been re-created as a robot? I haven’t been to Disneyland, but they’re all there apparently. From what I’ve heard, they say the Reagan one is very lifelike, but I think that’s more of statement of how un-lifelike the real one was. It may well be him. Do you think any Australian Prime Ministers could ever have had any interested furniture related stories? Having seen the office of the Prime Minister, it’s a very disappointing, jerry-built, IKEA influenced, generic room. There’s nothing special in there at all, because it’s not an illustrious building. I haven’t been in Kirribilli, but I imagine that would have some very nice furniture; Kirribilli House rather than Parliament House. Even Old Parliament House, there’s some pressed ceilings and some decent woodwork there. Do you enjoy the character of Roland in It’s a Date, and would you ever break him out again? It was good fun working with Rove. I kept listening to him (Roland), thinking “Oh, he sound’s like Fabio!” It was interesting, because it was a supporting character for Rove and Adrianne’s story, and as we didn’t see a lot of him I could make him a little big bigger than if he was the centre of attention. But as it turned out, he dominated quite a lot. Were you surprised how that edited together? Yes, because I had done a really big performance, like a terribly overdone one, but I think it fitted in. It didn’t seem too big. Is it more fun to play with someone else’s script, or your own? It’s different, it was all done with permission, it was all collaborative. It’s quite nice to come in just as an actor, I’ve done a bit of that lately. All care and no responsibility, just to look after your part. They sent me some outakes, which we very funny, some of the stuff between Rove and I. Were you trying to make him laugh a lot? Pretty much. For two people who’ve had their careers run along side each other, we haven’t overlapped that much. The only time I’ve ever really met him was on set, when we’re on camera. It was the first time I’ve spent any time with him off camera. Wasn’t there a time you brought a guitar on his show? Was he expecting that? No, we didn’t tell him. But he was good that way, he had no brief about what I was going to talk about. He was good fun to play with. And to his credit, Adam Hills did exactly the same. I think that’s more fun, I hate telling them what I’m going to do. Mr and Mrs Murder has been aired on PBS in America recently, are you surprised that’s it’s getting a successful audience over there? I can’t think why it wouldn’t work in the US. I’ve never really liked to play up the Australian side, I watch it in others, but it’s not something I usually do. So therefore, Mr & Mrs Murder had none of those hallmarks. (With no particular intention) it wasn’t “Australian”. It was peculiar, it had Kat’s sense of humour and my sense of humour and that was a good combination. In many ways it was the couple’s relationship which drove the enjoyment of the show. It was a very sweet and supportive one, with lots of the in-jokes that couples have, and it felt very real. It’s like the nicknames we’d worked out for each other. Nicola called me “Chuka-Khan”, and I called her “Fizzy”. We never explained it, and if you’d written it, they would have had someone explain what “Fizzy” meant – Nicola, Cola, Fizzy. That’s what I loath about a lot of bad writing, it’s so exploratory, and there is no room to give performances on another level to the writing. You’re just serving the writing, then going home. It was a way to have some decent dialogue. Of course, Shaun has already shared that there’s almost no chance of a second season of Mr & Mrs Murder, but we’re grateful for the one we got! During the interview, they found Shaun’s second last copy of The President’s Desk (which he’d used as a prop), which he was going to send to his mum – if only we got to hear her review! Thanks to Shaun, for being very giving with his time, as always. The Australian Academy of Cinema and Television Arts (AACTA) (formerly known as the AFI), held their annual awards for 2014 on January 30th. And the winner for Best Performance in a Television Comedy? 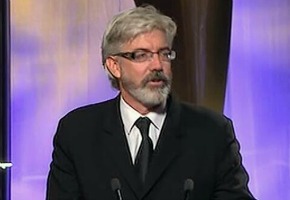 Shaun Micallef (of course), for Mad As Hell. Apparently he gave a cheeky speech poking fun at his fellow nominees (but I’ve haven’t seen it yet). And Kat Stewart, his Mr & Mrs Murder co-star, won Best Guest or Supporting Actress in a Television Drama for her role in Offspring. TV Tonight has it on very “good authority” that Mad as Hell will return to ABC1 in 2014. We’re not sure what authority, but since it’s good news, we’re going to run with it. But as David Knox points out, Mr & Mrs Murder is a long-shot to return for a second series, because, as previously noted on this site, it is largely dependent on funding. We’ll keep our eyes peeled for an official announcement on MAH! 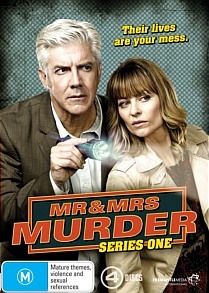 Now that we’ve been treated to the full 13-episode series of Mr and Mrs Murder (without a timeslot change either! ), you can now get all the episodes on DVD… as of 19th June. Pre-order from JB Hi-Fi or your favourite DVD retailer. With Mad As Hell finishing last Wednesday, and Mr & Mrs Murder next Wednesday, it looks like we’re going cold turkey on Shaun for a while. As alluded to at the end of the last MAH episode, there will be no more episodes before the federal election (September), which was mentioned at the end of season 1 as a possibility for new episodes. In fact, two sources at the show have advised there is no confirmation of a third season at all yet, but we remain hopeful. Likewise, we have no confirmation on a second season of Mr and Mrs Murder – this probably depends on a number of factors, including funding and network support. Shaun’s been flat out since Mad As Hell first aired this time last year, going straight into filming M&MM then the second season of MAH, so most likely he’s taking a bit of a break. Maybe to complete work on a new book? We’ve now been treated to 10 solid weeks of back-to-back Shaun each Wednesday, with Mad As Hell followed by Mr and Mrs Murder. But that unfortunately means we’re down to the last 2 weeks of both shows (what a coincidence?!). Knowing Shaun and the writers, we’re in for some really enjoyable moments. What have you enjoyed so far about either show, and which would you most look forward to returning? I really should be sleeping, but I need to express what a sweet, enjoyable and clever show Mr and Mrs Murder is. Shaun and Kat do a brilliant job as the central characters in this crime solving drama, and it’s really the relationships between the characters, which all felt genuine, that really make this show. The sleuthing is really there as a motivation, and a background interest. The dialogue never felt contrived – I could almost imagine many couples trading lines the same way. Bring on more of Charlie and Nicola! If you missed the first episode, hopefully Channel Ten will put it online soon. And Mad As Hell, that was brilliant as always – recap coming soon. Starting Wednesday 20th, you will be able to watch 1 and a half hours of continuous Shaun (excluding ad breaks and the moments when he’s off camera). Mr and Mrs Murder begins on that night at 8:30pm on Channel Ten, following Mad As Hell, which airs at 8pm THE SAME NIGHT! (but different bat channel, the ABC to be exact). If you’ve been living under a rock, Mr and Mrs Murder is a new comedy/drama starring Shaun and Kat Stewart, who are professional crime scene cleaners and amateur crime solvers. Read more here. So just 2 more weeks till you get more Shaun than you could ever hope for.